Amplifier No. 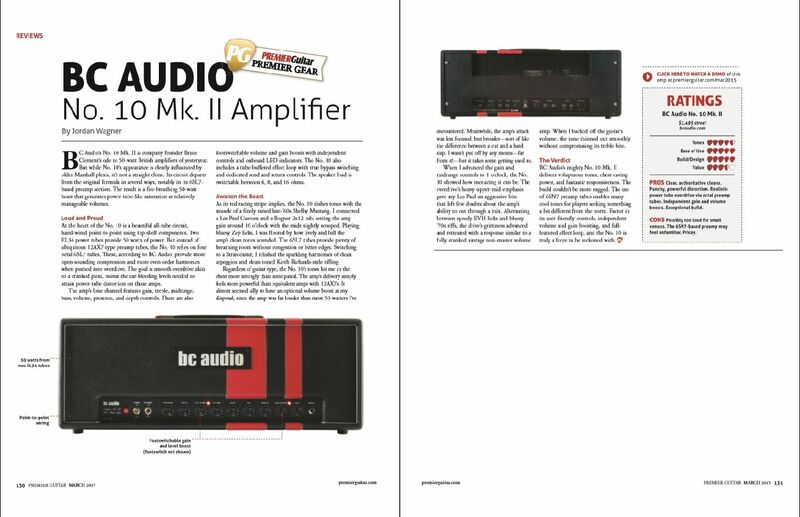 10-Mk.II is a highly flexible single-channel amp, with two independent footswith-activated boosts - Gain Boost and Volume Boost. 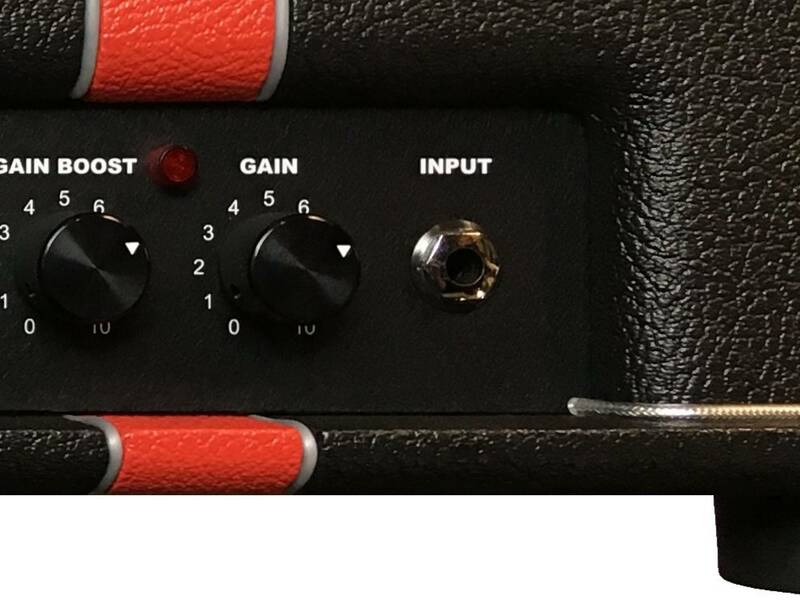 The tone controls are placed early in the circuit to tailor your guitar's sound before distortion. 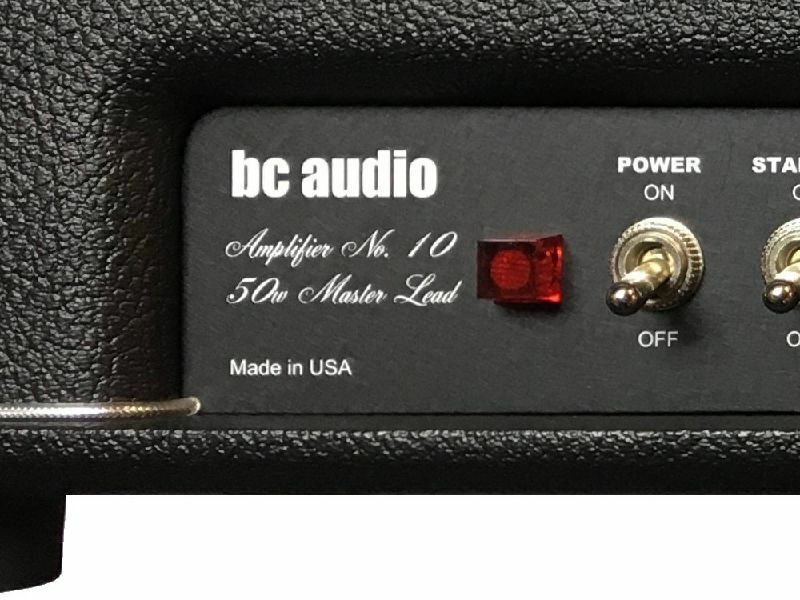 Like all BC Audio amps, Amplifier No. 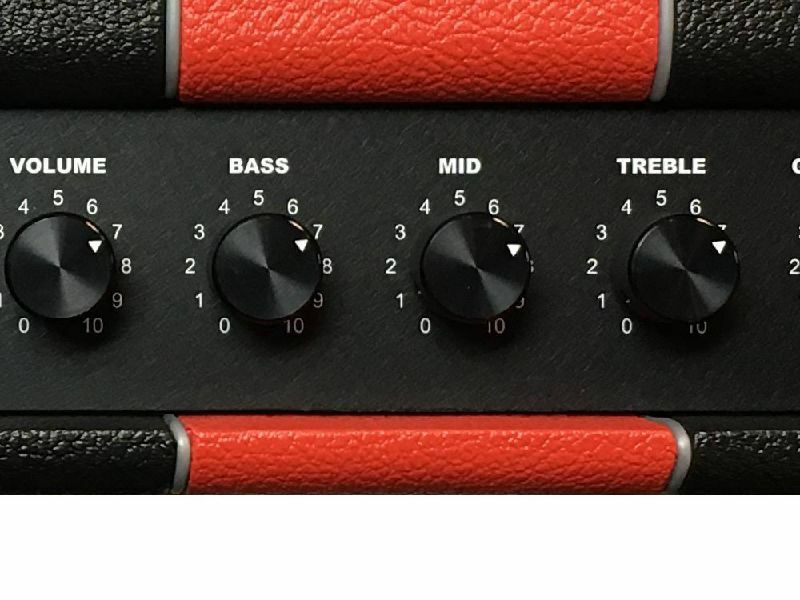 10 is meticulously hand crafted in true point-to-point fashion, and employs 6SL7GT octal preamp tubes for their rich, warm tone and power-tube-like breakup. “It sports fresh features in a crowded ‘boutique’ market. The footswitch puts four significantly different tone settings at the ready, making the No. 10 Mk. 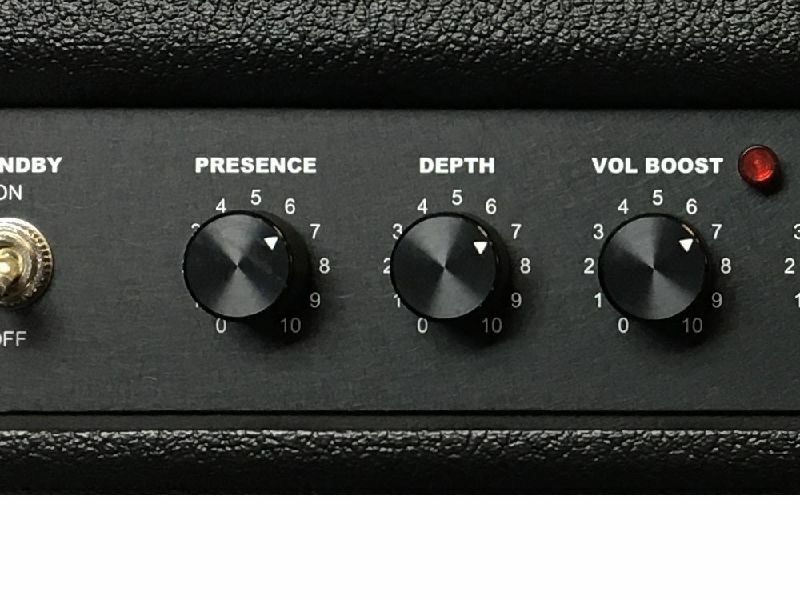 II akin to a four channel head. The cleans were huge and full with just enough grit. …monstrous blues-rock hues that would make Paul Kossoff smile. The reactiveness of this amp was amazing. 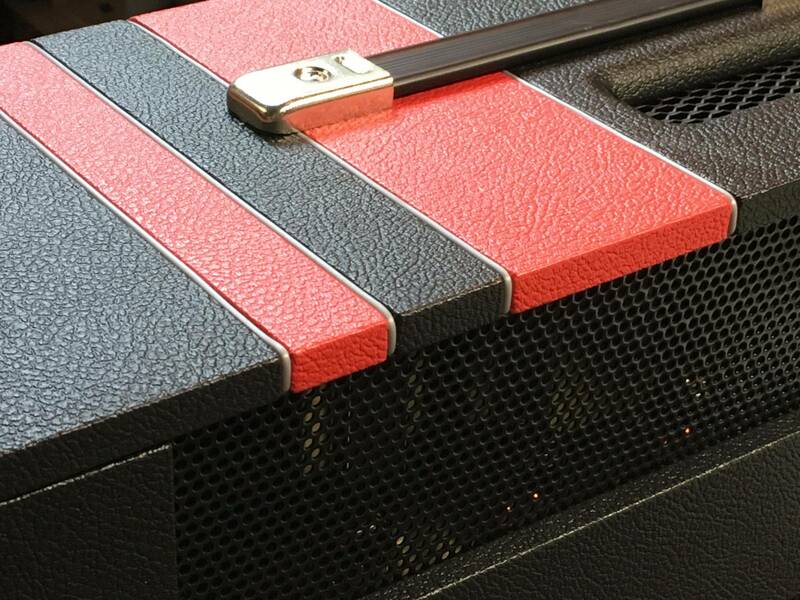 We could dial in the exact nuance of desired drive and the amp responded. 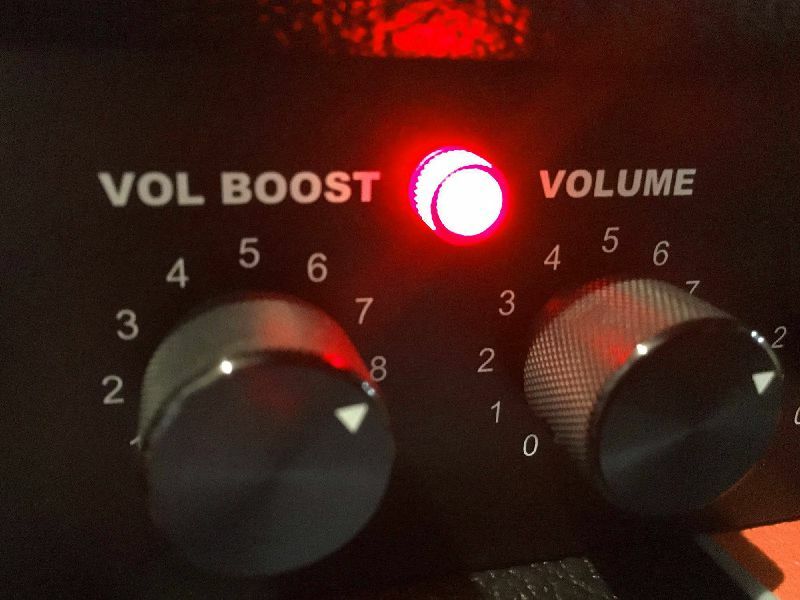 We pushed everything to the limit and were rewarded with heavenly hard rock and metal sounds, again with the emphasis on fat, broad guitar tone – no thin, brittle flavors, just earthshaking guitar tones. 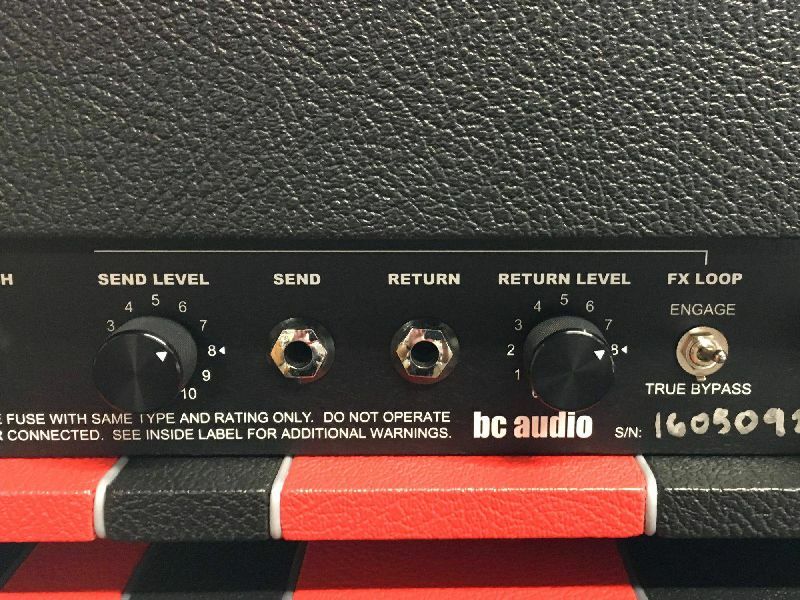 Throughout testing, the BC Audio Amplifier No. 10 Mk. II proved outstanding. From the superb build quality to the stunning array of tones inside, it’s a top-end tone tool any guitarist would love to own. “The No. 10 dishes tones with the muscle of a finely tuned late-’60s Shelby Mustang. I was floored by how lively and full the amp’s clean tones sounded... I relished the sparkling harmonics of clean arpeggios and clean-toned Keith Richards-style riffing. The No. 10’s tones hit me in the chest more strongly than anticipated. 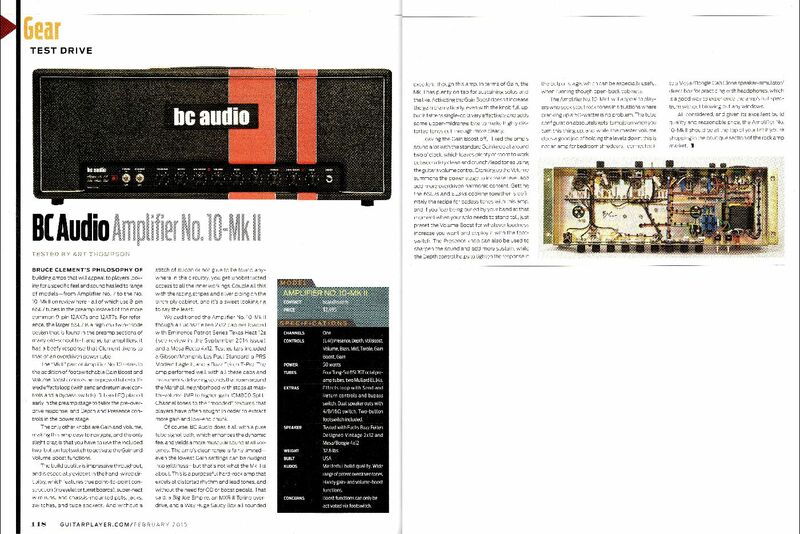 The amp’s delivery simply feels more powerful than equivalent amps with 12AX7s. The amp was far louder than most 50-watters I’ve encountered. The drive’s grittiness advanced and retreated with a response similar to a fully cranked vintage non-master volume amp. 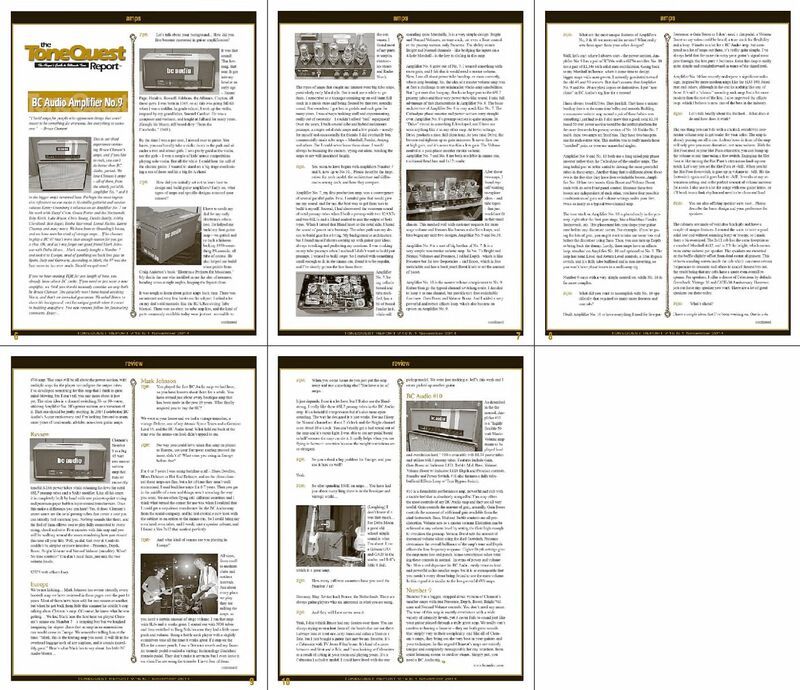 BC Audio’s mighty No. 10 Mk. II delivers voluptuous tones, chest-caving power, and fantastic responsiveness. The build couldn’t be more rugged. “Kudos: Masterful build quality. Wide range of potent overdriven tones. 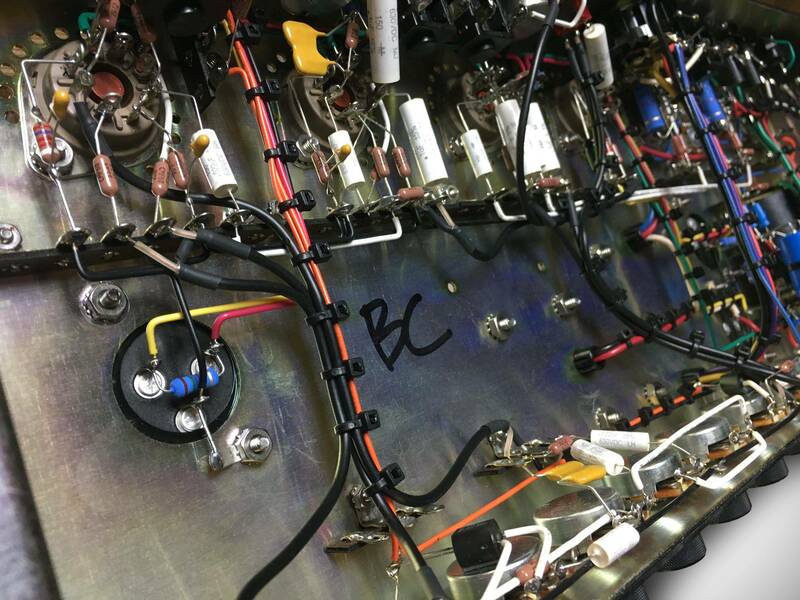 The build quality is impressive throughout, and is especially evident in the hand-wired circuitry, which features true point-to-point construction (no eyelet or turret board), super neat wire runs, and chassis-mounted pots, jacks, switches, and tube sockets. …it’s a sweet looking rig to say the least. …muscular sound at all volumes. …excels for distorted rhythm and lead tones, and without the need for OD or boost pedals. 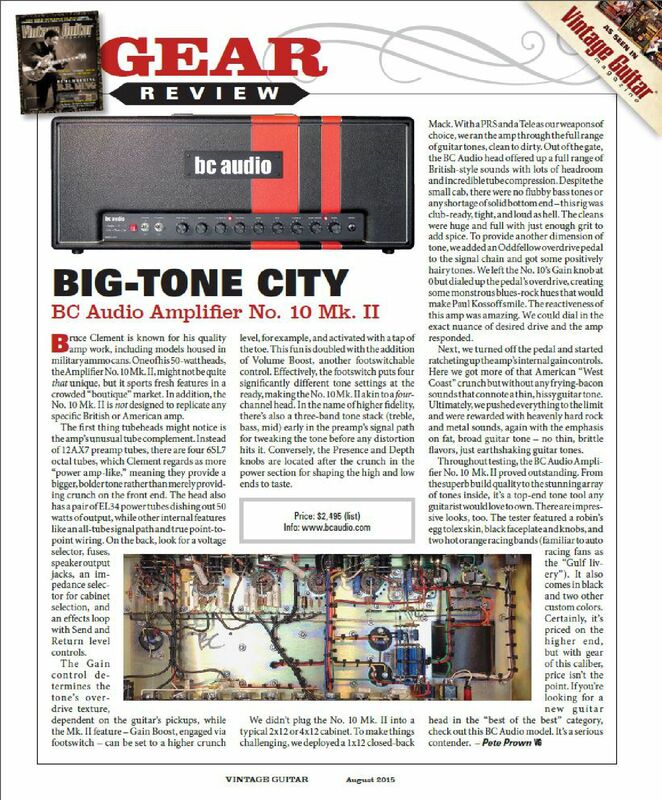 “If you like to rock, you can’t do better than BC Audio, period. We think you should seriously consider an amp built by Bruce Clement. You certainly won’t have heard anything like it, and that’s an iron-clad guarantee. Five minutes with [Amplifier No. 9] and you will be walking around the room wondering how you missed this tone all your life. Well, ya did. Get over it. Amplifier No. 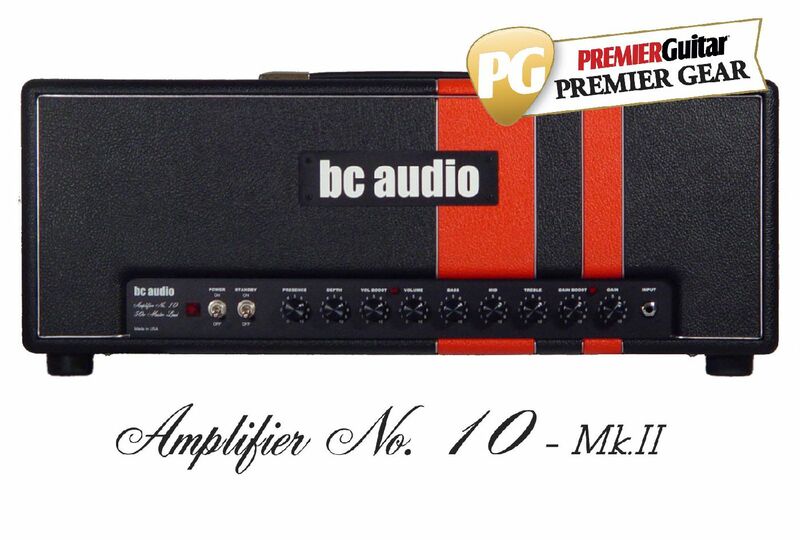 10 is a formidable performance amp, powerful and rich with a tactile feel that is absolutely unequalled.